I tried a new recipe last night that I found on Pinterest. It truly is all that and a bag of chips. A one pan dish is right up my alley, especially midweek when I rarely have time to cook meals. My normal weekly meal prep was busted on Saturday when the meat market sold out of turkey and chicken. They could not fill my order of 15 boneless chicken breasts, chicken patties and turkey patties. The display case was nearly empty! The display case looked almost like it was closing, except it was only 12:30 in the afternoon! What the???? I asked the staff if they had a crazy special or something but they said they did not. They were as confused as I. 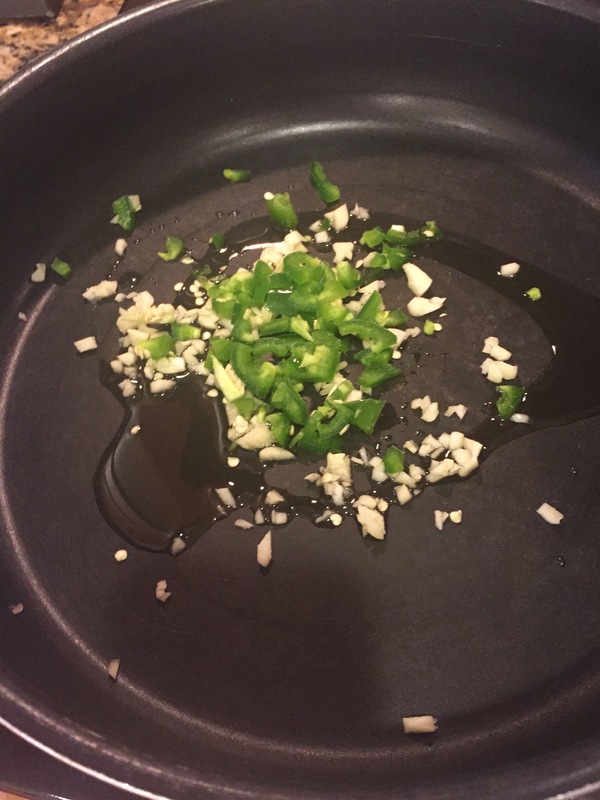 A quick sauté of fresh garlic and one jalapeño pepper. 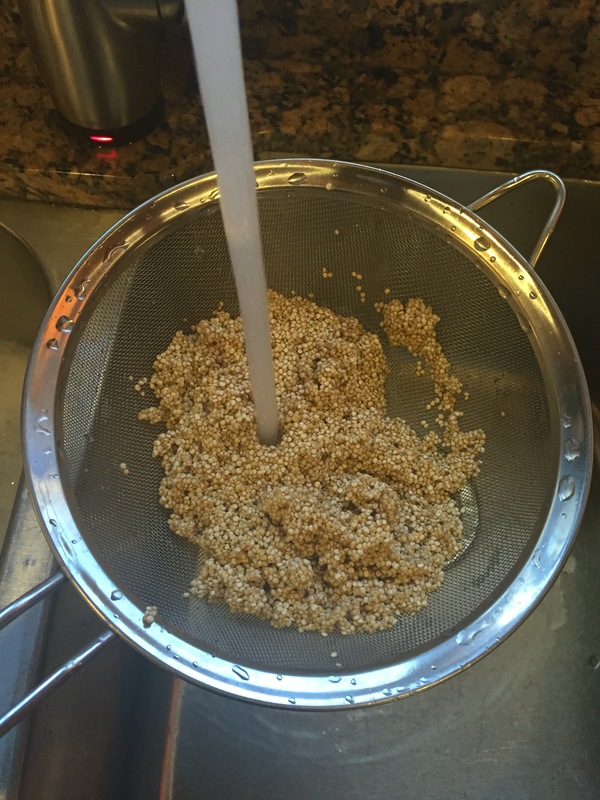 Although the the recipe does not call for rinsing the quinoa, to eliminate the sometimes bitter taste, I rinse my quinoa with water before cooking. The finished product was so damn good! Wow! The recipe belongs to Chungah at Damndelicious.net. Chungah, doesn’t know me, but I am grateful the Pinterest Post. 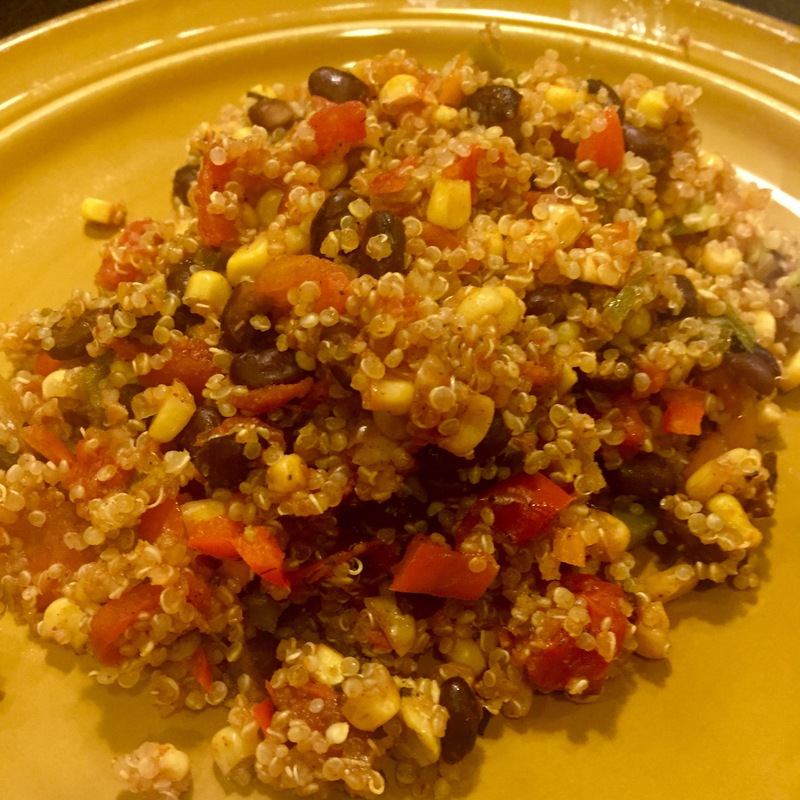 Here’s the link to the One Pan Mexican Quinoa recipe. This was delicious, quick, and packed with protein. This recipe is the newest addition to my rotation of vegetarian recipes. It’s funny how situations work themselves out. My 2016 vision board includes an image to remind me of my goal to eliminate meat (chicken & turkey) from diet. Why? I guess from all the bodybuilding training, I have grown tired of eating chicken and turkey. I gave up beef in either 1994 or 1996. I don’t miss it. My goal is to replace my protein source to mostly plant based sources. I will still eat seafood. I don’t know if this is a permanent change or a needed break from animals but I am ready for a diet change. 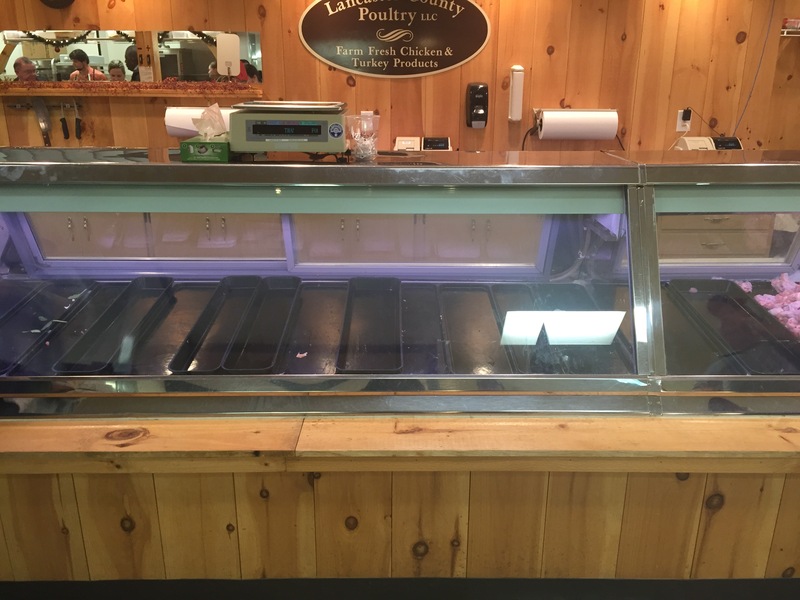 The empty meat case of was God’s way of reminding me of my goal for the new year. Since I had no intentions of buying meat locally for myself, I was forced this week to work on my new goal. Today is day two of no chicken or turkey. All is good. Meanwhile I continue to search for vegetarian recipes. Thank goodness for Pinterest. 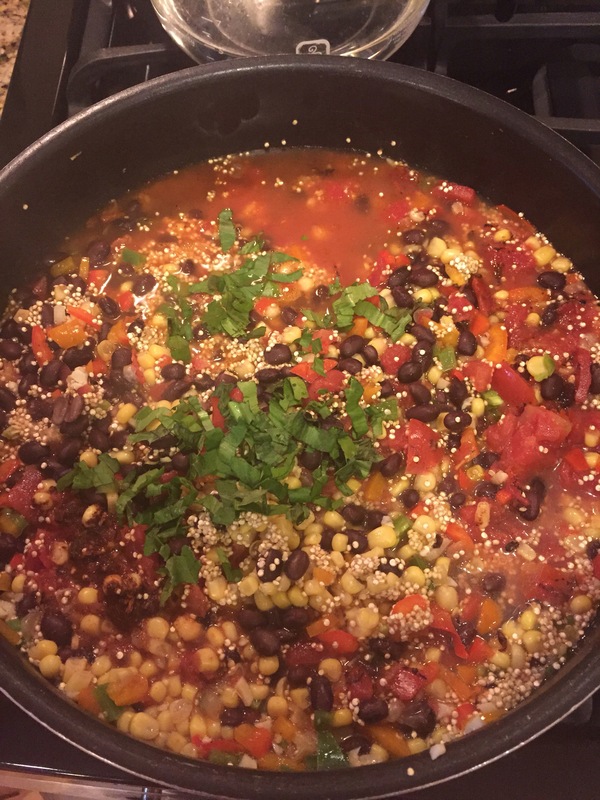 This entry was posted in Family Living, Fitness, Healthy Eating, Healthy Living, Inspiration, Uncategorized and tagged 2016 goals, Bodybuilding, healthy meals, Nutrition, poultry, Quinoa, vegetarian meals, vision board. Bookmark the permalink.